Bijele stijene - impressive rocky towers in wild mountains - Explore Croatia Become a Patron! Croatia’ s wealth and diversity make it one of the world’s most beautiful countries. Its sunny Adriatic coast is known throughout the world, but there are other places as well, despite the fact that not many people think of Croatia as a mountainous country, mountains make up a third of its territory, Croatia’s mountains are a refuge of intact nature. 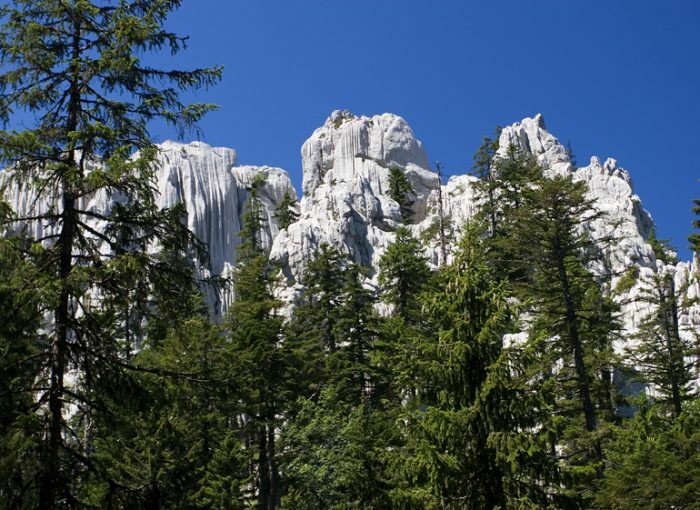 Bijele stijene are a group of impressive, glistening white rock, towers that stick from the dense and wild forest of Gorski kotar. It is one of the wildest places in Croatia, where from the rocks you can’t see any human structure. 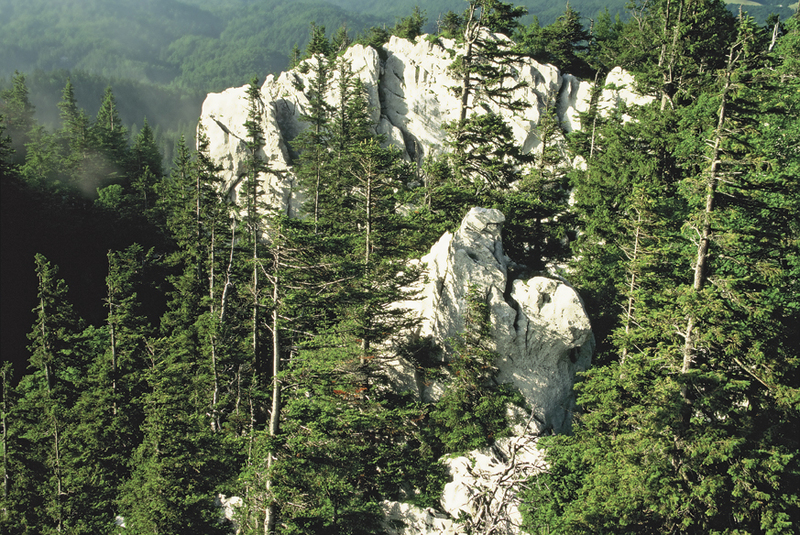 Bijele stijene are limestone peaks on the eastern side of Gorski kotar. They are not very high, around 1300 meteras above the sea, but its very wild landscape makes it so special. The journey to Bijele Stijene starts on the one side from the town of Ogulin and goes all the way to Jasenak. The latter is an idyllic village with typical pastures and wooden houses. As it is the rural community closest to the reserve and lies along a good road, it is usually the starting point for the mountaineers who visit the reserve. The alternative, from the other side is Delnice via Mrkopalj and then Begovo Razdolje. From here, the journey continues along a longer forest path dating back to the time of Turkish rule. The entrance to the reserve is reachable by vehicle front both directions, except in winter when snow blocks the area. Near the mountains is Bjelolasica, the Croatian Olympic Centre. You can stay in the mountain hut. It is constantly open in the summer time,and on weekends on other seasons. It offers overnight accumulation for about fifteen people, as well as a well-equipped kitchen. Next to it is a cistern with drinking water. Less than fifty metres away, a shelter with 30 beds and a wooden stove have been built. Although it is less comfortable than the hut, it is always open and has served many hikers during the winter months. As we began our difficult ascent into the woods, heavy snow began to fall. A steep slope, deep December snow and huge snowflakes sticking to our faces didn’t help our progress. Moreover, at one point, we found ourselves in the middle of a real blizzard, and the air turned into a whirling of snow that prevented us from making a single move. Despite ibis, there was complete silence throughout the forest, a soft silence, without betraying a sound of life. In this lifeless landscape, only the whiteness of the snow could be seen, as well as the sleeping black beech trees, whose tops were completely shrouded in snow. The place exuded a strange, almost magical atmosphere, where man seemed out of place. The forest is part of the Bijele Stijene (White Pocks) nature reserve, and starts at the end of a winding road, where the mountain starts to rise steeply from the flatter wastelands of Hapela, This mountainous region of Croatia, called Gorski kotar, is located at the bottle-neck between the continental lowland bell and the Northern Adriatic. Now, as we climb in silence, it is easy to experience the solitude that dominated the region for a long time until it was revealed to the outside world by ranger Jakob Mihelčić, He showed the way to the well known botanist Dragutinl Hirc, whose series of travelogues and scientific finds attracted the attention of the general public. The depth of the snow close to the peak has increased significantly, reaching up to three metres in the drifts, Dazzling whiteness becomes the prevailing element, completely masking the beech trees, now much shorter, with widely spread low and gnarled tops. However, the snow ceases to fall, and is replaced by a thick fog seeping into the forest, somewhat distorting all the images. Somehow, the eerie feeling disappears and is replaced by an enchanting winter idyll. 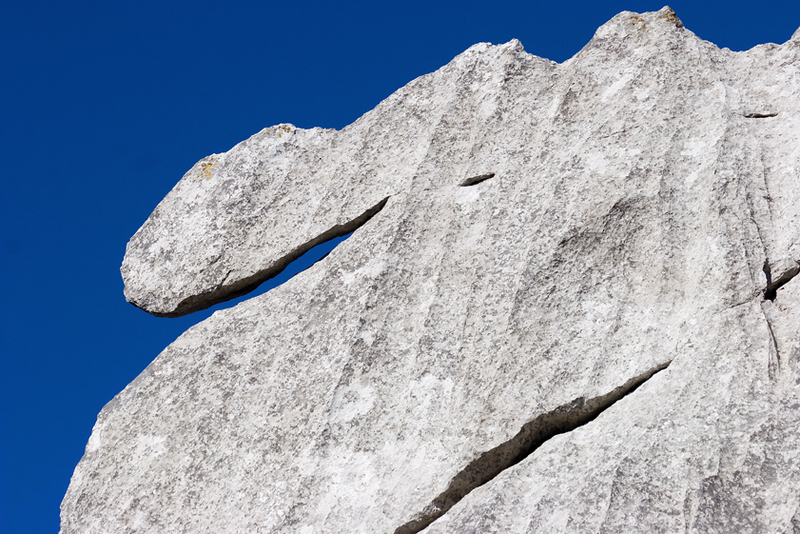 We finally climb to the very peak, discovering that nothing can now be seen from this huge rock. 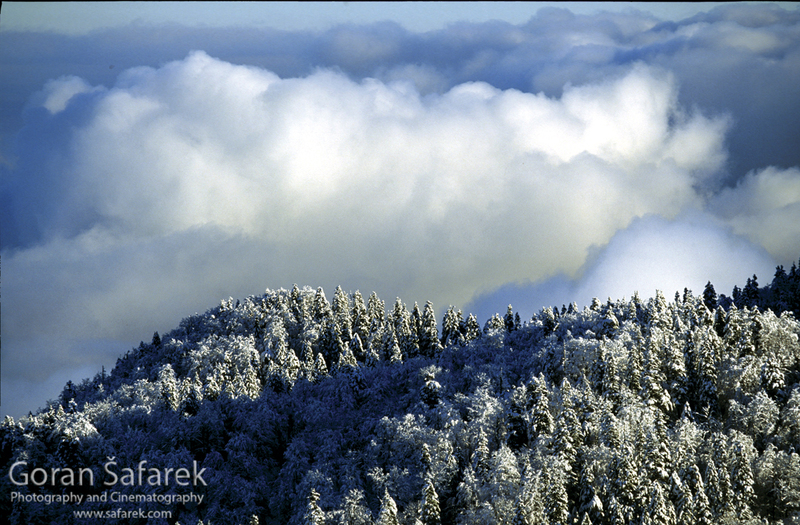 Clouds rush around, covering everything, just every now and then revealing the closest of the frozen trees. We therefore returned to a small plateau be-low the peak where there are two lovely little huts. They seemed to have grown into the, snow, hidden behind the while arms of the trees and fused into the rocks with their tall and narrow roofs. They were barely visible in the all-encompassing whiteness, and according to more experienced mountaineers’ stories, they had been buried under snow more than once and could not be found. The first mountain hut was built in this kart valley back in 1929. It was named after an explorer. For a long time, it was very popular among mountaineers, but over time, it became dilapidated, and so the Kapela mountaineering society from Zagreb built a new one, it fits nicely into the landscape on the rim of this karst valley, mounted on tail pillars to protect it from the damp. 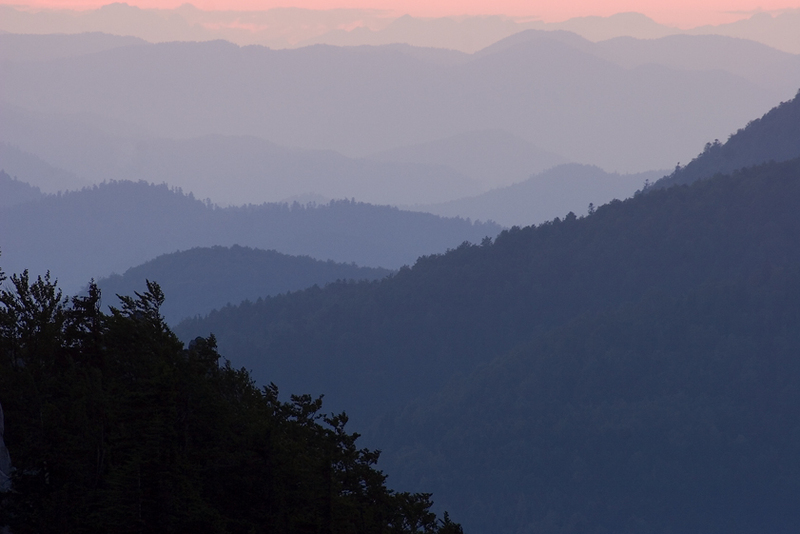 These conditions attract a great number of hikers at almost any time of the year. They have at their disposal well paths which run along Bijele Stijene and lead to many of its attractions. The splendour of the following morning, entering through the window of the small mountain shelter, was an irresistible invitation to go outside. There, beech trees covered in snow jutted out into the endless azure of the sky. Our breath froze, as the clear night had drained all the heat from the air. This scene made the peak, still hidden by rocks and trees, even more alluring. The path to it runs through small fir and beech woods, which the sun had not yet reached. This shaded place bore witness to the harshness of the wind and cold In the form of thick layers of frost of extraordinary shapes. It is quieter down in the abyss, where old, but still strong firs use from the depths. Their tops are trimmed according to the direction of the wind, and beneath them is a cemetery of old trees with their dry and dead stumps peeping through the now Crossing to the other side brings an utters different atmosphere. We carve out through a narrow passage into a vast space basking in light that offered pleasant warmth despite several little grey clouds in the sky. The image was a primeval one, with intact, virgin snow, without any sign of human existence, the soft lines of the treetops and tips of the branches cloaked in white. Once more, were at the top, but this time the view from 1335 metres above the sea is magnificent from any side. The hills gradually become smaller as you go inland, disappearing into the thick sea of tog and row, rolling cloud. We are aware that the towns in the plain are suffocated in greyness, while here, on the mountaintop; everything shines in vivid and rich colours. Less than ten kilometres away from the peak is the sea, and it’s hard to grasp from this position how close it really is. To the south there is the mountainous plateau of Lika, with the mighty Velebit range rising behind it, and finally lo the north and west, Gorski Kotar. However, besides these remote areas and panoramic views, it is Stijene that attracts the most attention. A number of stone pillars up to 50 metres tall, rising from the crest of the mountain, present a dominating view as they gleam while in the middle of the forested landscape. This mountain spur is almost four kilometres long, making arund 2 km2 of the total surface area. The direction of its orographic axis equals that of the Dinaric Alps, but its composites is divided by tectonic rifts and ruptured by karst processes into individual groups. 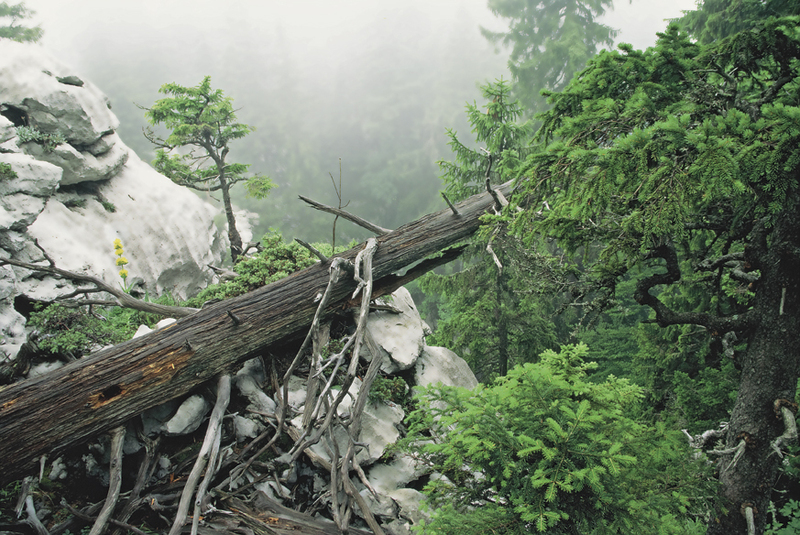 The distinctive whiteness of the rocks and the deforestation are core sequences of the long-term erosion that has turned the ridge into a natural phenomenon. The ruthless power of water, ice and cold has finely carved the rocks, sharpening their edges, grooving them and moulding them into different shapes. Although they are covered by a thick coat of snow, which softens their contours and makes them monochrome, even now, in winter, they clearly stand apart from the slender fir trees due to their frightening size. This quality of erosion is a feature of the karst landscape, and the root of its beauty. A lot of the credit for this natural phenomenon, which is lacking elsewhere in both this quality and quantity, is due to the rockiness of a large part of Croatia. Instead of standard mountain scenes with grandiose shapes, micro-relief is highly developed here. This is apparent when we look at the neighbouring peaks below the forest, which are plain and ordinary, and no match for these rocks. Only Bijele Stijene and the neighbouring Samarske Stijene can captivate the human imagination and stir an adventurous spirit. This is an area full of narrow passages, hidden caves and small meadows, known as gardens made up of groves and grass. In the shadow of deep karst sink-holes, the snow stays long into the spring, and the edges of abysses hide hundreds of secret spots which one can crawl through and explore, but also get lost in. The diverse shapes compel one to recognise objects from everyday life with the consequence that the names given lo some of them are not so surprising. Here, you can find stone fingers chapels, domes, tubs, chests and many other things. This is all in the karst kingdom, dominated by true virgin forest. It is almost beyond belief that plants can grow in the bare rock, particularly the tall spruce-trees. Crna Draga – a valley between Bijele Stijene and Samarske Stijene only two kilometres apart as the crow flies, but in reality much more distant due to the difficult terrain, is particularly impenetrable. 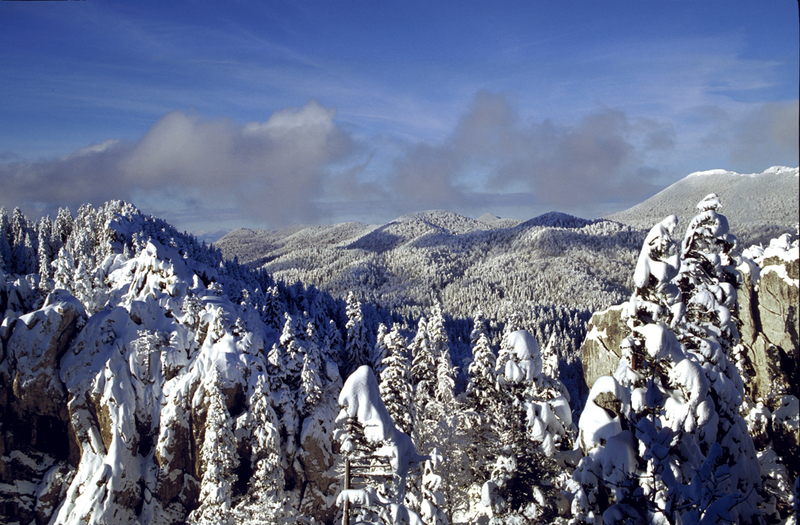 The belt of forest vegetation stretches from the foot of the massif Ire the rocks on its crest (fir, spruce, beech, and maple), while a pine and juniper-tree belt grows in the rocks. The flora is characterised by its many alpine species. The fauna includes bears and other large and small mammals, such as foxes, weasels, skunks, dormice, martens and badgers. All of this combined with the well-preserved environment, prompted the Croatian Mountaineering Association to request legal protection for the rocks. This action was successful, and the peaks of Bijele Stijene and Samarske Stijene were declared nature reserves by the Croatian Parliament. It is the combination of wilderness and the beauty that attracts many mountaineers, particularly on fed on standard mountain landscapes. 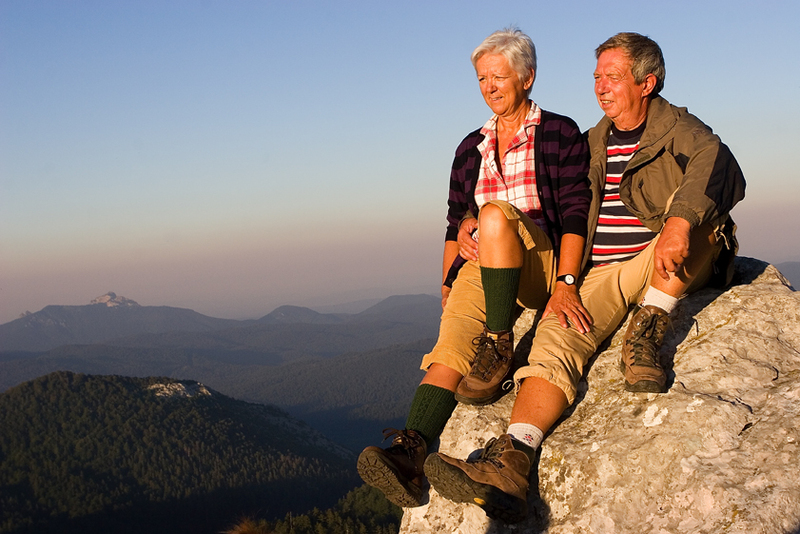 This increasingly means foreign visitors, as the trend of adventure holidays and ecotourism rises around the world. The proximity of the sea is an additional advantage, which makes it easier for tourists to make one-day excursions in the summer. But winters here are magnificent 100, as we’ve now discovered. 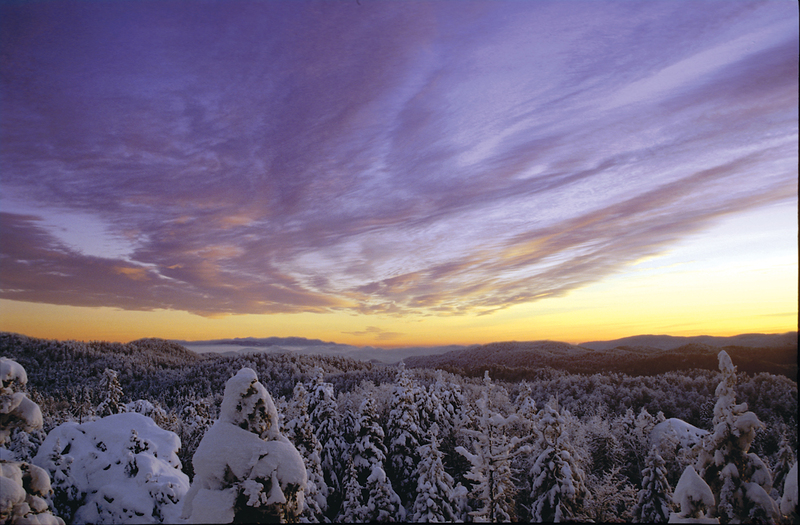 It sounds strange that tens of thousands of Croatian citizens go to expensive ski resorts in France, Austria or Italy without realising that their country offers winter beauties of its own. The sun began to set towards the sea and the entire landscape began to change. It first turned yellow, and fir-trees cloaked in white began to sparkle in the gentle rays of the sun, while the scattered islets of mist in the valleys glowed, burned by this new warmth. The colours shimmered, infused with Life, and new shapes of elongated grey rocks emerged. As the sun drew closer to the on sea, it became bigger, as if angry at having to disappear, and filled the sky with redness. The hills and valleys burned with hot colours, and fire and ice were united as it was set ablaze. And then the fiery ball disappeared, Everything died at once, only the horizon still shone, as the last reminder of the day that had gone by, The first stars glittered shyly, and only high and thin clouds were sti alive, illuminated by the dying rays of light from the west. The silence pierced the ears and the cold numbed our fingers. The smell of the wilderness spread from the endless woods where bears and wolves roam, and we were overwhelmed by the sense of solitude and dignity. 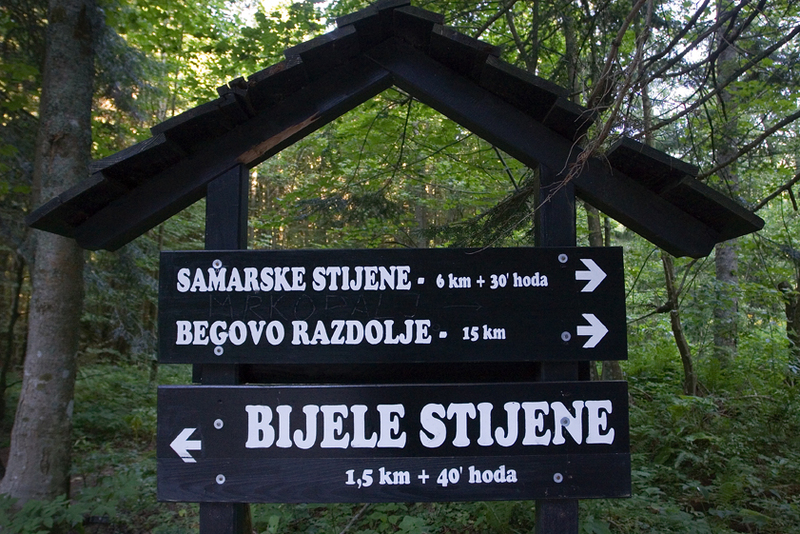 You can reach Bijele stijene with your car through the mountain road from Jasenak village (pull of the asphalt road in direction to Jezerane – watch fot a sign, then continue on a dirt road until you see another sign).If your car is 4×4, you can climb even more, park your car near the smll shelter. From here just climb 45 minutes until the mountain hut or shelter on Bijele stijene. Alternatively, you can hike from the asphalt road; it takes one more hour longer.